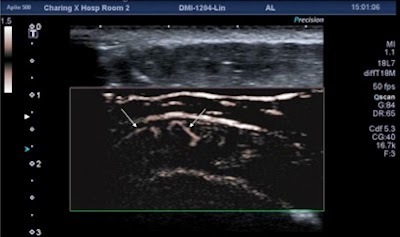 February 17, 2015 -- A new Doppler ultrasound technique can provide better visualization of low-grade inflammation in joints and tendons than power Doppler ultrasound, yielding clinical information that often influences patient management, a team of U.K. researchers recently found. The technique, called Superb Micro-Vascular Imaging (SMI, Toshiba Medical Systems), offered better visualization of microvasculature, enabling the detection of low-grade inflammation not previously identified with power Doppler, concluded Dr. Adrian Lim, from Imperial College Healthcare National Health Service (NHS) Trust, and colleagues. "This has significant clinical impact, leading to a change in management in 25% of our patients in this study population," said Lim, who presented the research at the RSNA 2014 meeting in Chicago.